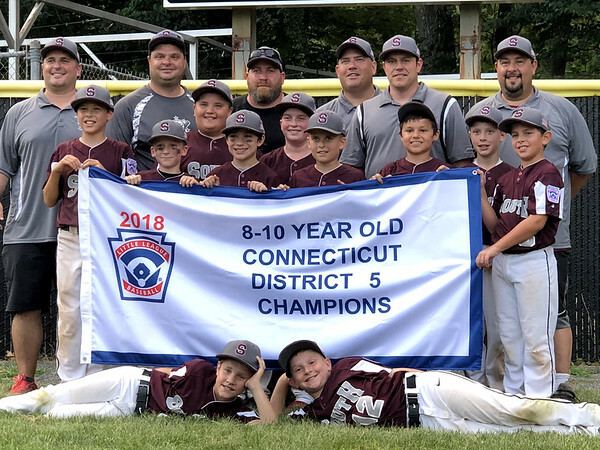 BRISTOL - The Southington South 10U all-star baseball team is raising a banner. Led by Rocco Davino on the mound and shortstop Connor Lentini, Southington South took control early and never looked back, defeating Berlin 5-1 in a deciding Game 3 at McCabe Waters Field en route to the District 5 Championship Tuesday night. Davino was lights out on the mound from the beginning for Southington. The pitcher gave up the lone run in the first inning on an RBI-single from Berlin’s Justin Eckrote. Davino gave up just five hits and walked one batter in 5.1 innings of work. He also struck out two batters, both coming in the fourth inning to halt a Berlin rally. Noah Legnani and Gabriel Satalino were the only Berlin hitters who had an answer for Davino. Both Legnani and Satalino each had two hits in the game, with Satalino’s both going for extra bases. Davino was fortunate to have great defense behind him, led by Lentini. The shortstop made plays all game long, including one leaping and one diving grab in the sixth inning to help secure the win. Davino admitted having Lentini’s help, along with the rest of the defense, was a crucial part of his success. Lentini was also strong at the plate. He reached base twice, including a leadoff double in the fourth inning that started a three-run rally to help Southington South spread the gap. Despite the loss, Berlin head coach Matt Catalano was proud of the effort his team out forward, not only in the title game, but throughout the season. Southington South has a quick turnaround heading into the sectional round of the state tournament. The all-stars will play the winner of District 6 on Friday. Luckily for them, they won’t have to go very far, since Southington North is the host. Posted in New Britain Herald, Berlin, Southington on Tuesday, 10 July 2018 21:23. Updated: Monday, 16 July 2018 12:36.